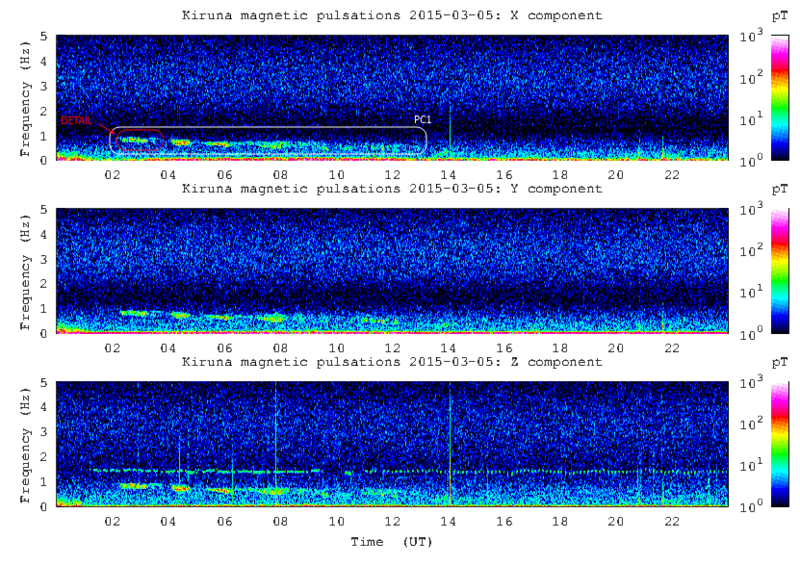 PC1 detected by IRF of Kiruna (http://www.irf.se/maggraphs/puls.php). The white box contains the entire all-night pulse , in red box (pointed as detail) the one received from Cumiana observatory. Stereo file acquired with two orthogonal induction coils: NS on left channel, EW on right one. RDF reception: colors indicate the signals coming direction. PC pulsation is indicated in white box and is basically composed by east-west components. 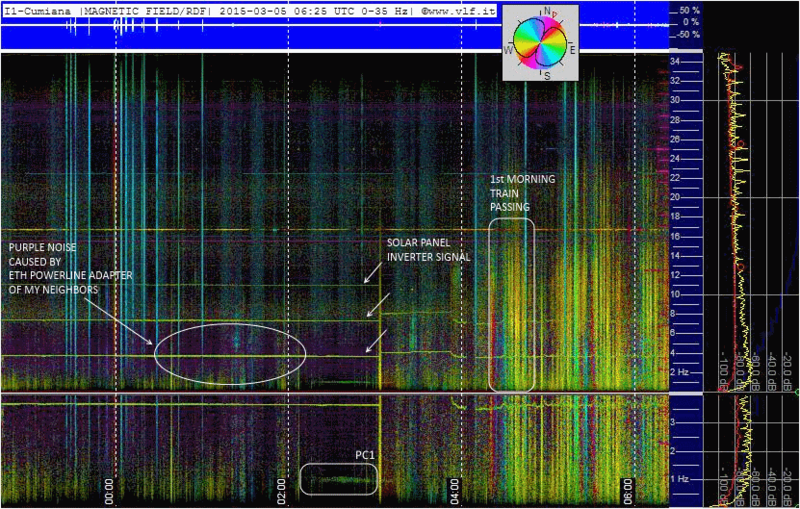 The top of the spectrogram identifies the various types of present noise. Here the two channels are analyzed in separate way, with sonic visualizer. In NS directions interferences are very high: they are caused by an Ethernet Power Adapter used by a neighbor, located 100 meters away. This gives an indication of how delicate the choice of "where to place" an induction coil can be. Noise apart, this pulsation has components only in East-West direction. 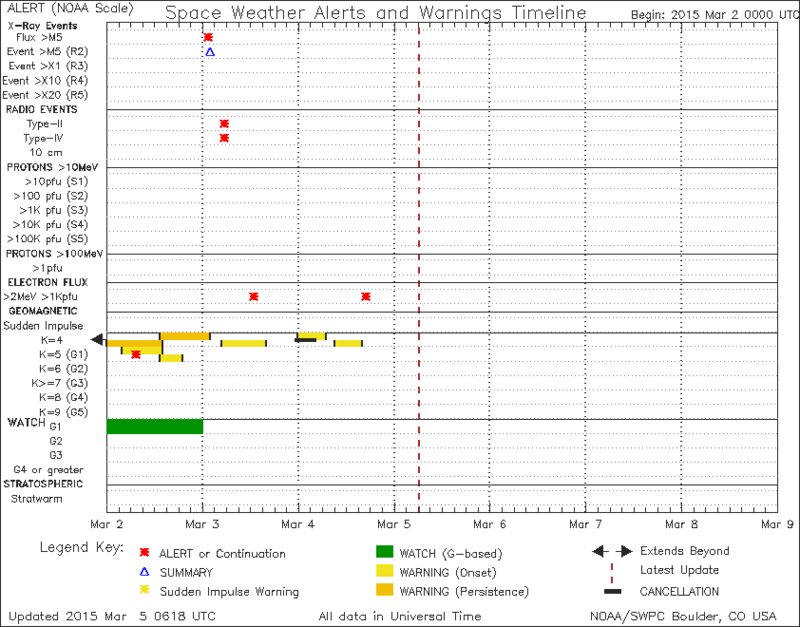 This belies, as already happened before, that the geomagnetic pulsations are best received orienting the coil for receiving signals in a north-south direction, because of their polar origin. The pulsations can occur with signals oriented in all directions, as they are generated at relatively close distances compared to the wave length, and we are therefore in the reactive area. By years of experience in these receptions we realized that usually the best coil position for Geomagnetic Pulsations and Schumann resonances reception is the East-West (then with the axis pointing north-south).